My daughter Masha and I have recently received a gift – a gift of theater – generously presented by Theater You. 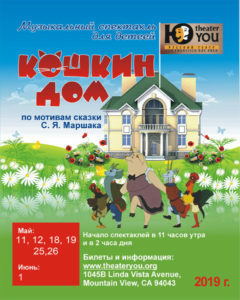 The play we saw is a story about a little girl and her best friend Karlsson – a mischievous, yet good natured fellow, who lives on the house roof, likes to brag and often gets in trouble, but does it with so much humor, wit and imagination that you can’t help but liking him and wishing for a friend like that. “Theater You” has not only created an amazing, professional quality production including captivating plot , heartfelt acting and a rare harmony of stage decorations, costumes, sound and light effects, but also built an invisible, yet so real, bridge connecting generations, cultures, countries… It all started with a children’s book by Swedish author, Astrid Lindgren, about Karlsson, who became wildly popular back in the days of my childhood in the Soviet Union and continues to be children’s favorite character. Now Theater You, a local community theater in Mountain View, California, has brought it back to life for me, my children, and many others. Part of this memorable experience was seeing the play through my daughter’s eyes – as she was holding her breath in anticipation of the unknown, or almost falling off the chair laughing, or worrying about the characters getting in trouble and feeling relieved when it all worked out. Following the action on stage was as enjoyable for me as seeing my daughter being mesmerized by the magic of the theater. And I’m grateful to the Theater staff who devote all their free time, energy and put their hearts into it to make this magic happen. At the end of the play the little girl (main character) receives a jingle bell from Karlsson, so she can ring it any time she wishes to see him again. I couldn’t help but think to myself: “I need one of those at times to remind myself to believe, to dream big, and to see inspiration in my surroundings”. Little did I know that my wish would come true. After the play Theater You staff has given us our very own jingle bells – a little, yet so touching and meaningful gesture. Thank you!